The elegant Forster kitchens are also available in the trendy colour taupe. Taupe initially grew to become a must-have in the fashion industry, and is now being increasingly used by interior designers as a design variant for carpets, walls or upholstered furniture. Taupe is a mixture of grey and brown and is neutral in colour. It fits perfectly with all white or wood tones and has an unparalleled modern and refined look. Forster uses the restrained colour in matt, which lends fronts a particularly sophisticated appearance. Hardly any other colour fits so harmoniously into modern design concepts. 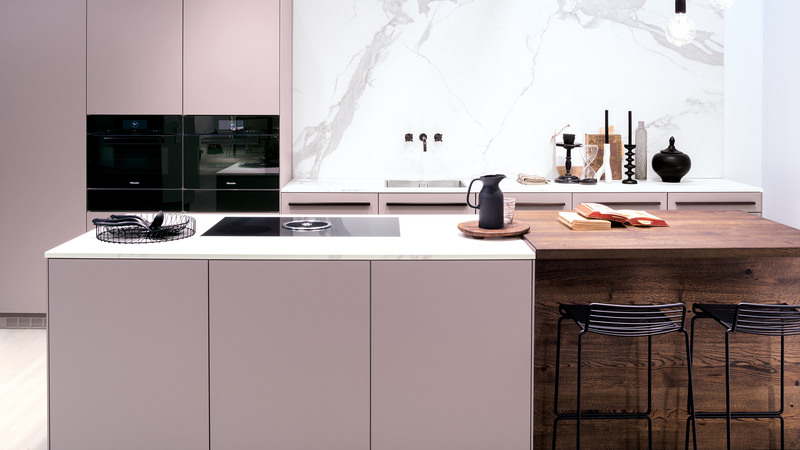 The new kitchen model from Forster not only convinces thanks to its modern colour scheme, but also comes to life due to the coordinated choice of materials and the touch and feel of its surfaces. The kitchen island, which stands clear and straight in the room, is completed by a fitted table in smoked oak. The oak wood complements the warm colour shades in a very authentic way and ensures additional cosiness in the room. Family members or guests can watch the cook work while sitting comfortably on the black high chairs, which pick up on the colour of the fittings. The marble look countertop and rear panel, which complete the overall concept in a very clean manner, contrast with the warm fronts. The worktop and rear panel are made of ceramic, a very robust material produced using natural raw materials such as alumina or quartz sand. Just like the Forster fronts, this material is easy to clean, very hygienic, absolutely free of harmful substances and therefore outstandingly suitable for contact with food. The black fitting is a striking feature. It is embedded directly into the rear panel and has solid, plain handles – one for hot water and one for cold water. While the fitting stands out as a design element, the profile handles in bronze virtually blend into the fronts. Discreetly shimmering, they pick up on the interplay of the steel fronts’ colours and form an additional highlight. A Forster kitchen not only meets the highest of design standards but also convinces with technical refinements: the heavy refrigerator door opens with a light touch as if by magic, and if you forget to close it completely, it closes automatically after a short while. Pullouts and drawers can be opened simply by specifically touching them gently. Once again, Forster skilfully combines puristic design and functional sophistication – designed for longevity and guaranteed, lasting pleasure.